We all know the importance of regular exercise and the crucial impact it has on our mental, physical, and emotional health. Despite all of these benefits, some days you just don’t have time to squeeze in a workout. Thankfully, new studies have shown that walking at least fifteen minutes every day can add seven years to your life. One study followed sixty-nine people between the ages of 30-60 and found that those who engaged in daily moderate exercise, such as walking, experienced anti-aging benefits (1). 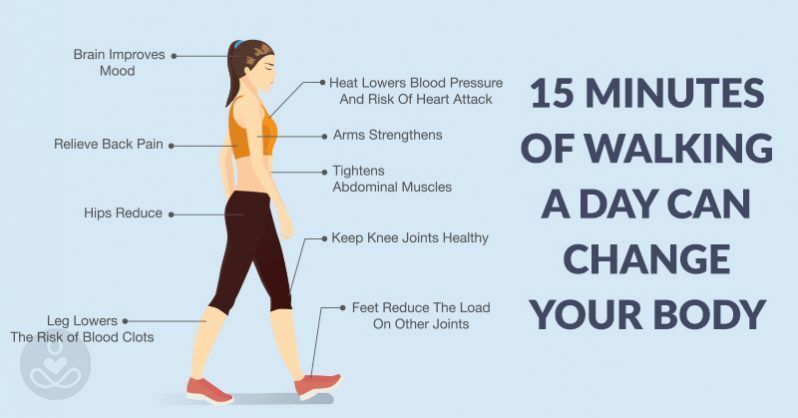 So, if you know you won’t be able to do your regular workout due to an early morning meeting, taking a 15-minute walk on your lunch break or after dinner could get you the same benefits. Among 10,269 male graduates of Harvard College, walking at least nine miles a week was linked to a 22% lower death rate. Among 44,452 male health professionals, walking at least 30 minutes a day was linked to an 18% lower risk of coronary artery disease. Among 72,488 female nurses, walking at least three hours a week was linked to a 35% lower risk of heart attack and cardiac death and a 34% lower risk of stroke. Did you know that walking can positively boost your mood… without you even realizing it? (4) A 2016 study found that walking for just twelve minutes resulted in an increase in attentiveness and self-confidence (3). One study (5) concluded that there seems to be a link between walking (at a preferred speed) and cognitive performance in both children and adults. Studies have shown (6) how moderate intensity walking can help lower the risk of high blood pressure. According to the results from the Harvard Nurses’ Health Study (7), women who walked at least thirty minutes daily, decreased their risk of diabetes by 30%. Walking has proven to be effective at shrinking dangerous abdominal fat that can cause diabetes. A research study done by Cancer Epidemiology, Biomarkers & Prevention (8) found that women who walked at least seven hours per week were 14% less likely to develop breast cancer. Scientists at the University of California, San Francisco and Harvard University (9), found that men who had prostate cancer and who walked at least three hours a week reduced their chances of a recurrence. In an article by the American Heart Association (10), they explain how walking can significantly improve mobility loss for people with peripheral artery disease (PAD). Swing your arms: bend them at 90 degrees and pump from the shoulders. This allows for a quicker pace and provides a workout for your upper body (11). Wear comfortable shoes: look for flexible soles and stiff heals, or any cushioned, lightweight, and low-heeled shoes. Try to avoid stiff soled shoes that don’t bend (11). Make sure your posture is correct: you should look straight ahead with your chin parallel to the ground. Also, keep your shoulders down and back and away from your ears (12). Picking the right pace: to burn more calories, you should be walking at least 3.5 miles an hour. Tip: take smaller, faster steps to speed up (12). Try an incline walk: for an even more fat-blasting workout try walking up small hills, up and down stairs, or on a treadmill with the incline up (12). Check out this article for more tips on how to get the most out of your walk. The benefits of walking daily are astronomical, as it positively effects both your mental and physical state, leaving your mind and body happier and healthier! So grab your shoes and your music and start moving those legs! This post was republished from The Hearty Soul. You can find the original post here.